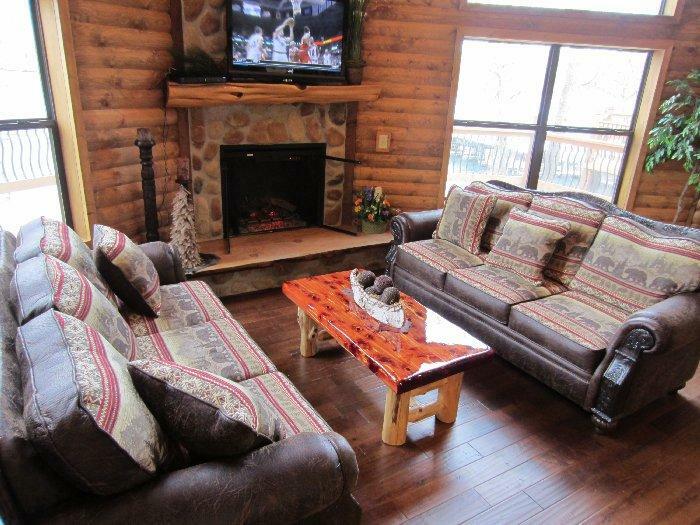 When you first walk into the Black Bear Lodge, you will be greeted by a Full North American Black Bear mount and a beautiful log antler chandelier. 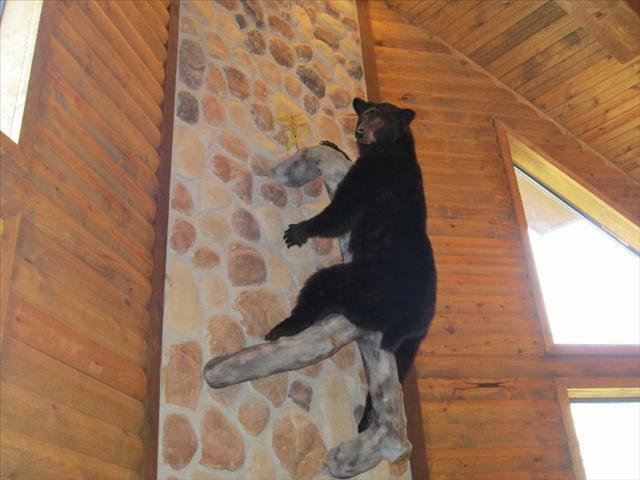 The Black Bear Lodge is adorned with Bear decor throughout the chalet. 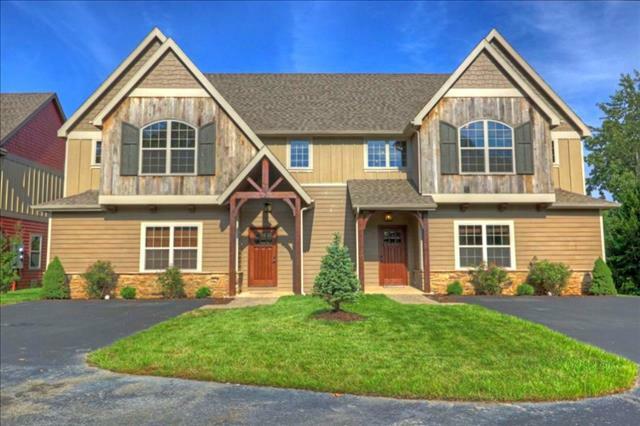 This is a three-level home with a full walkout basement including 5 well-appointed bedrooms, new designer beds and furniture, 3 full bathrooms and a fully equipped gourmet kitchen with stainless steel appliances. Inside the chalet you will find upscale and BRAND NEW high quality furnishings, antler style lighting fixtures, Natural Slate tile floors, solid granite countertops, all bedrooms have 32" flat panel TVs, Brand New luxury bedding, charming tongue-and-groove ceilings, solid log pine walls and a majestic 25 foot floor-to-ceiling River Rock stone fireplace, complete with a wall of windows to better enjoy the view of beautiful Table Rock Lake! 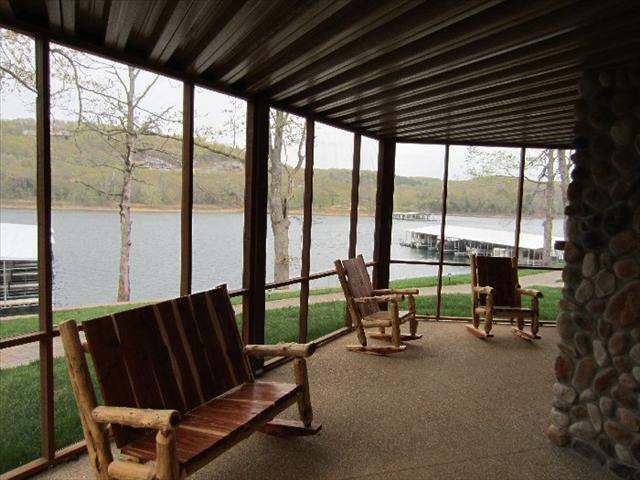 When you walk outside the main level of the chalet, you will find a 12x35 solid exposed aggregate deck with panoramic views of Table Rock Lake. The top deck is also furnished with a quality patio dining set with six sling chairs and a huge automatic tilting umbrella. The screened-in patio directly below the top deck provides outdoor enjoyment with a large river rock stone outdoor wood-burning fireplace, two solid red cedar log rocking chairs, one double log rocker, a patio dining set with six sling chairs and all this enclosed in a screened in environment. The Master Suite encompasses the entire 3rd level of the chalet and has a Brand New solid red cedar log king size bed, custom made red cedar log furntiure, new Serta presidential suite top of the line mattresses, knotty pine tongue and grove vaulted ceilings with 12" Rustic beams, full luxury bath with jetted tub, separate tiled shower and two copper vessel sinks installed in a solid granite countertop, 32" Flat Panel TV, large walk in closet, and a solid wood computer work desk. 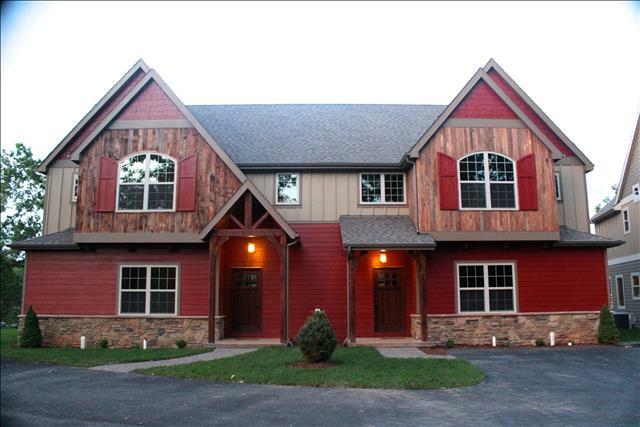 On the main floor you will find the great room with 25 foot ceilings, a spacious gourment kitchen with solid granite countertops, a granite bar with three custom made log bar stools, a custom dining room table with eight log chairs lighted by a rustic wagon wheel chandelier and a full guest bathroom. There are two quest bedrooms on the main floor with have brand new solid wood QUALITY queen size beds, solid wood furniture, new luxury bedding and 32" flat panel TV's. Downstairs you will find a natural slate tiled living area that has an awesome theater room with surround sound, a card/poker table and bumper pool. There is two sliding glass doors in the basement living area that walk directly out to the screened in porch with the outdoor fireplace. 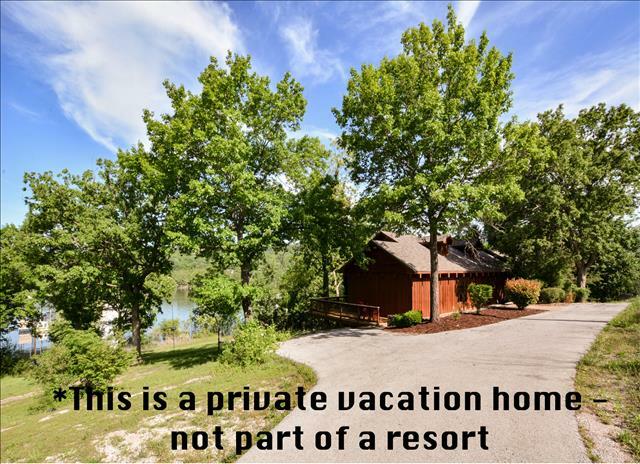 Through the downstairs hallway you will find a laundry room with full size front loader washer and dryer, a full bath and two additional guest bedrooms, one with a queen size bed and the other has a custom made red cedar full over queen log bunk bed. This fine property will feature an exceptional and panoramic view of gorgeous Table Rock Lake in Branson,(Lampe) Missouri. 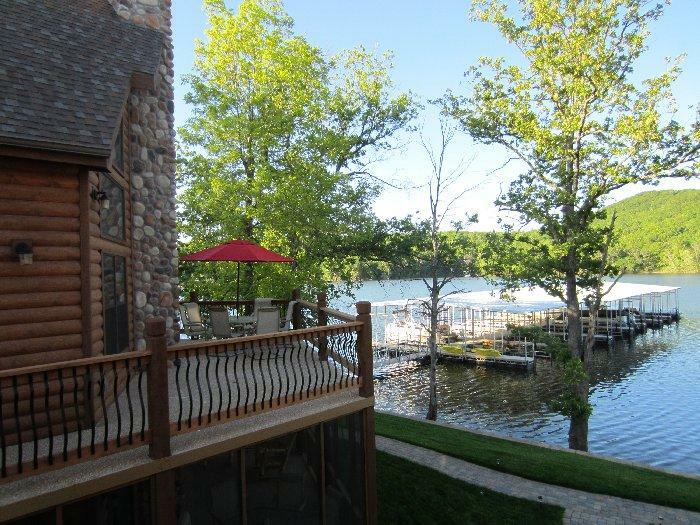 This home is conveniently located only 50 feet from the shoreline of the lake. 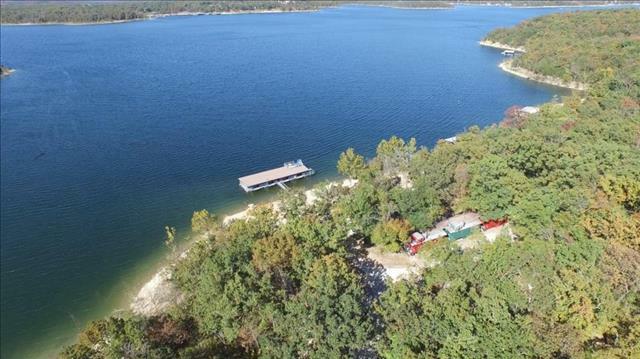 We are building a total of four lakefront homes on this property, so we can accommodate large groups or family reunions up to 60+ guest. Below is an artist’s rendering of the home. This will be a three-level home with a full walkout basement including 5 well-appointed bedrooms, new designer beds and furniture, 3 full bathrooms and a fully equipped gourmet kitchen with stainless steel appliances. Inside the chalet you will find upscale and BRAND NEW high quality furnishings, antler style lighting fixtures, tile floors, granite countertops, flat panel TVs, Brand New luxury bedding, charming tongue-and-groove ceilings, solid log pine walls and a majestic 25 foot floor-to-ceiling River Rock stone fireplace, complete with a wall of windows to better enjoy the view of beautiful Table Rock Lake! The Master Suite will have a Brand New solid wood king size bed, full luxury bath with jetted tub, LCD TV, and will encompass the entire 3rd Level of the home. The other bedrooms will have brand new queen size beds and a flat panel TV's. 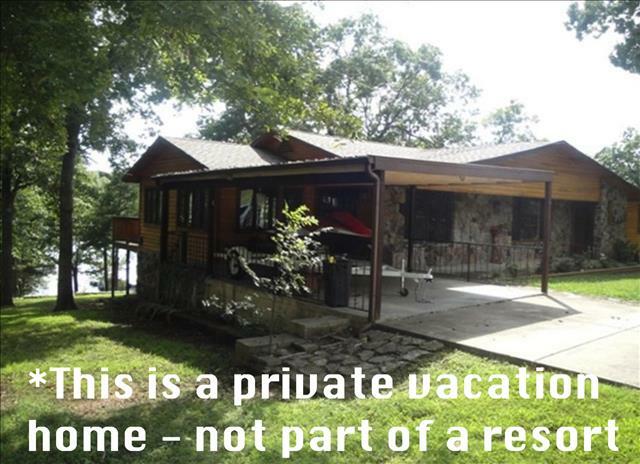 The exterior will be finished in all log siding with a huge deck for all your entertaining needs. There will be two living areas for your families to relax and watch TV. The downstairs living area will have an awesome theater room with surround sound, a card/poker table and bumper pool. There is also a full size laundry room for your convenience downstairs. 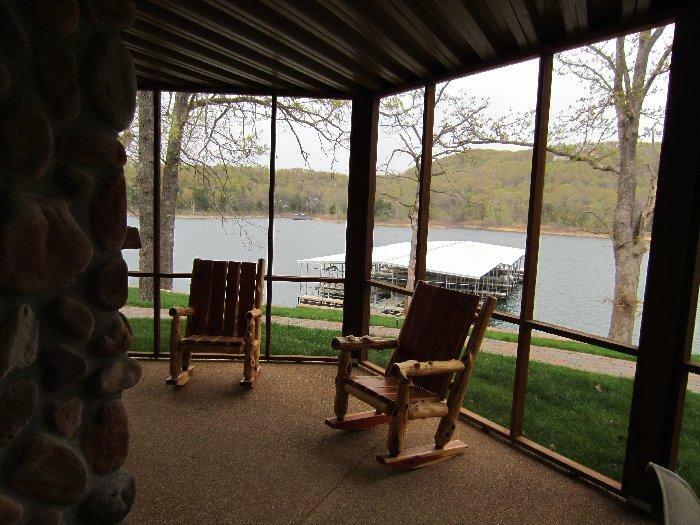 A screened-in patio below the top deck will provide outdoor enjoyment with a huge stone outdoor wood-burning fireplace in a bug-free environment. This will be a first class adventure for a vacation that will bring you and your family memories to cherish for a lifetime!